This is the language of power and it has dominated the world ever since. Cain killed his brother Abel because he felt he could exercise power over him. He was not driven by love to serve him, rather he was driven by power working through hate (Gen. 4:1-10). Abimelech, king of the ancient city of Gerar, wanted to forcibly take Sarah as his wife, but God prevented it (Gen. 20:1-3). What about the African slave trade? Local chieftains would connive with slave traders to capture innocent people and sell them into slavery. The Civil Rights movement was launched to end the segregation of Blacks in American society. The Egyptians oppressed the Jews because they were afraid of them (Exodus 1:12). Fear has a way of working alongside power. Tyrants are motivated by fear – fear of losing power, fear of their enemies, etc. And fear, as John tells us, is opposed to love (1 John 4:18). In the first place, he did the unthinkable – he took on human nature. The almighty God, Sovereign Lord of the universe, the Great Being whom sinful and helpless men throughout the world look to for help. He became like his own creature. He did not just enter into the human condition, he took on its most despised form – the form of a servant (Phil. 2:7). A servant is not one you normally invite to parties; human societies don’t select servants to rule over them. A servant typically occupies the lowest rung on the ladder of social status. And this was the spot that God took when he came to earth. Finally, in becoming a servant, perhaps he could have chosen to serve the dignitaries of the earth. He possessed such wisdom and knowledge at a tender age that he gained acceptance to a discussion with learned men (Luke 2: 46). Surely, Pilate or Caiaphas would have been glad to have such a person wait on them in their palaces! But, not Jesus. He became a servant to the most despised in the society. He met with tax collectors (one of the most hated groups in Jewish society at the time). He preached to the multitude (the rich don’t move with the multitude). 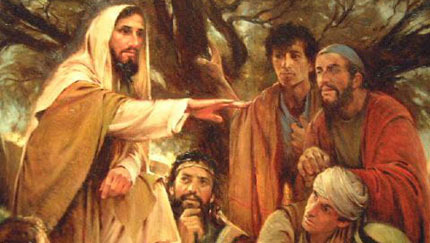 He moved among the lepers, the blind, the demon- possessed, and he healed them. His disciples were men of no reputation – fishermen, revolutionaries, tax collectors, etc. And he faithfully served and taught them. On the night before his death, he did what no Jewish rabbi would do. He attired himself like a servant and washed the feet of his disciples one by one, leaving this symbolic act as an eternal legacy that life does not consist in ruling over others. On the contrary, life is truly lived only in loving service to others (John 13: 1-17; Luke 22: 24-27).